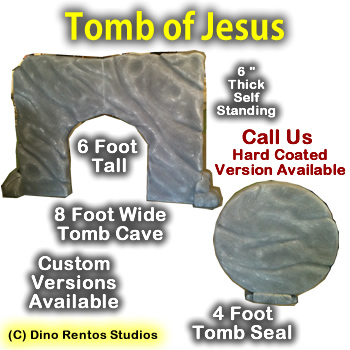 Tomb of Jesus Foam Display/Prop - Dino Rentos Studios, INC.
Great for stage productions and retail displays. 8' wide by 6' tall by 6" thick facade. Painted foam and hardcoated versions available; specify below. The optional hard coating feels like rock.